Nikhil n I had gone to Sector 18, Noida market [during lunch... don't get any weird ideas when u read this.....] to pick up some ingredients for a Banana Chocolate Milkshake [a recipe I saw on the program Nigella's Kitchen on Discover, travel and Living, which incidentally turned out to be a great hit]. It was available in four flavours – Irish crème, Mochaberg, Berry Blast, and Chocomint. Now we wanted to try them all but were confused as to which one would be good, since the packs placed there were really large. Came back to office n decided to make all of them in the evening. Shared it with Snigdha, Lalit and Nikhil. The packet said "The single serve sachets include coffee, milk and sugar in a pre mixed powder, sufficient to make one refreshing cup of delicious Ice Cappuccino. 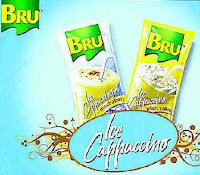 The creamy & frothy cappuccino can be prepared in seconds by adding 170 ml (a cup) of chilled water." I read, that Karan Johar had launched these flavours some time in the middle of May and did a promotion with Adlabs. Read the Indiainfoline article here and the agencyfaqs article here. She even write a post about me "This One Is For U....Nachiiiii" . couldn't figure out why...... being a huge fan for non-veg food... i was saddened...... decided to read more about it when i got to office. found a in link in a new feed "Ahead of Environment Day activists of People for the Ethical Treatment of Animals wear biohazard suits to create awareness about ill effects of meat consumption" but still can't figure out the "how" and "why" of the situation. how meat is toxic for human beings and for the environment. Twelve Steps to Help You Kick the CO2 Habit... read them here. 2007 - Melting Ice – a Hot Topic? 2006 - Deserts and Desertification - Don't Desert Drylands! 2005 - Green Cities – Plan for the Planet! 2004 - Wanted! Seas and Oceans – Dead or Alive? 2003 - Water – Two Billion People are Dying for It! 1999 - Our Earth - Our Future - Just Save It! Get more info on wikipedia about World Environment Day.